This album is just astonishing! Since Rob Halford re-joined the band after working with his own groups Fight (with guitarist Russ Parrish ï¿½ otherwise known as 'Satchel' from Steel Panther) and 2wo (alongside John 5) as well as having his solo career, Priest have released just the three albums in the dozen or so years following his return to the mic stand ï¿½ the standard, previous-album-referencing 'Angel Of Retribution' (2005), the hit-and-miss conceptual double CD/triple vinyl 'Nostradamus' (2008) and the return to classic Priest 'Redeemer Of Souls' (2014). 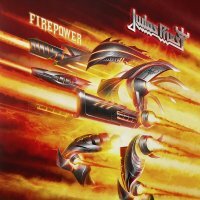 All three have their merits with experimentation (Don Airey's keyboards and classical touches, for example), but with 'Firepower' Priest have lit the touch paper and blown all pretenders to their throne out of the water! To put it in perspective, Halford is sixty-six years old, guitarist Glenn Tipton is seventy and has been suffering from Parkinson's disease for the last ten years, founding bassist Ian Hill is sixty-seven and drummer Scott Travis is fifty-six. It beggars belief that they've made an album of this magnitude, quality and ferociousness! It is surely the energy and vitality of "new boy" Richie Faulkner, a mere thirty-eight years of age, that has re-energised the band after cutting his song-writing and playing teeth on their last record that was a return to the classic Priest sound that the fans had been demanding. Just take a listen to the opening triple salvo. The title track itself is a Thrash Metal surge of speed and intent with Halford's stronger lower register giving it the grit and spit of Heavy Metal Armageddon, 'Lightning Strike' is a rollicking juggernaut that slam dunks you through the hoop and the powerful 'Evil Never Dies' with its searing chorus just leaves you with the stupidest grin on your face. This quite possibly could be one of the greatest Metal albums in Priest's career, maybe even surpassing some of their most iconic classics such as 'Stained Class', 'Killing Machine', 'British Steel', 'Screaming For Vengeance' and even 'Painkiller'. With other songs like the brooding 'Never The Heroes' (an unintentional, perhaps, nod to Saxon's 'Broken Heroes'), the epic 'Rising From Ruins' with its Iron Maiden-esque melodic sequences and the melancholic epic power ballad 'Sea Of Red', Judas Priest have quite possibly raised the bar for Power/Heavy Metal bands to reach up to that nobody could have predicted. If you don't own this record, then you can't call yourself a Heavy Metal fan!